Welcome to week 6 with our litter of Golden Retriever pups! We’re getting close to the end of our journey with our little, furry, fuzz balls. Our original plan was to keep half the litter to train as service dog puppies. At 6 weeks old these little pups start showing enough personality to start thinking about who we would keep to raise as service dogs and who would become loving pets. This week was also the first time we gave a few mock tests to see which of our pups had the moxie to be a service dog. 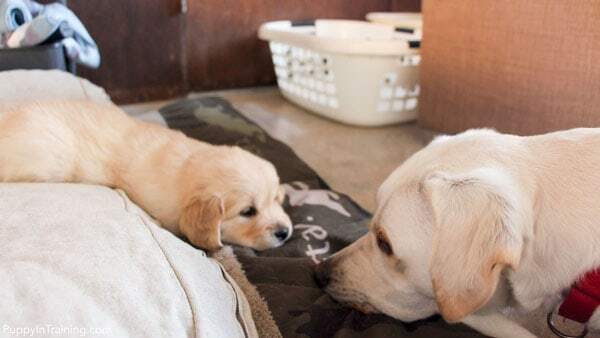 So, what are some of the traits we are looking for in a future service dog puppy at this young age? A puppy that is willing to work for his partner. A puppy with a calm temperament. 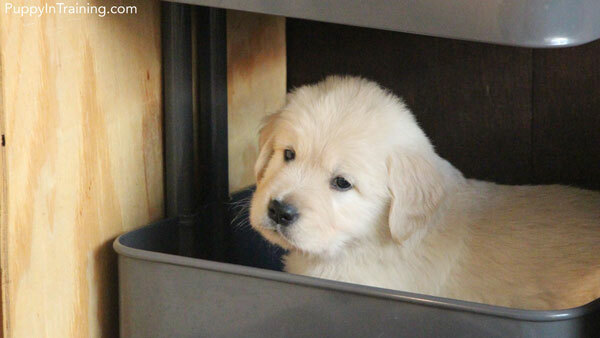 *In week 8 we put the puppies through a full scale temperament test. As you will see some were better suited then others as candidates to become service dog puppies in training. QUICK RECOMMENDATION: If you’re thinking about bringing home a puppy we recommend picking up a copy of Puppies for Dummies. Not only is it a great book on how to raise and train a puppy, but there’s also a section in the book on how to choose a puppy from a litter. These little pups are starting to get some girth especially Patriot who was pushing 8 lbs at only 36 days old! The size gap between our smallest and largest puppy keeps getting bigger as Patriot is well over a pound heavier then Trooper. Day #36 – Archer loves puppies! Archer was very curious since day 1, but even though he and Raven were best pals she still was protective of her puppies. We continued to socialize our Golden pups with people young and old. Some of our favorite puppy raiser friends stopped by and brought over their grandchildren to play with the pups. At this age the puppies like running around and act like hams. Long gone are the days of the docile, sleepy puppies. Welcome to the wonderful world of running wild Golden pups! Day #40 – Our Little Golden Explorers! As time moved on these guys became more and more mobile and less easy to contain in small environments. A few weeks earlier they started climbing out of the short wall in the whelping box. As the below picture illustrates this little one enjoyed climbing onto this shelf making it his own doggy bed. *By week 8 a couple of these little guys became quite the escape artists and learned to scale the side of the whelping box! Our little Golden puppy in hiding. Week 1 – Six Golden Retriever puppies are born! Week 6 – This is Week 6! Okay guys and gals. If you’ve raised a litter of puppies to week 6 then you know we’re heading into the difficult weeks. Almost every time I return to the whelping box it looks like a poop war broke out. It sounds funny now, but the sight and stink are not fun. Thank god they’re still as adorable as can be. Have any of you ever raised a litter of puppies? If so, tell us your story in the comment section below. If you’re prepping for a litter of puppies we highly suggest taking a look at Puppy Culture DVD and Workbook. I wish I had the DVD and Workbook before our first litter of pups. 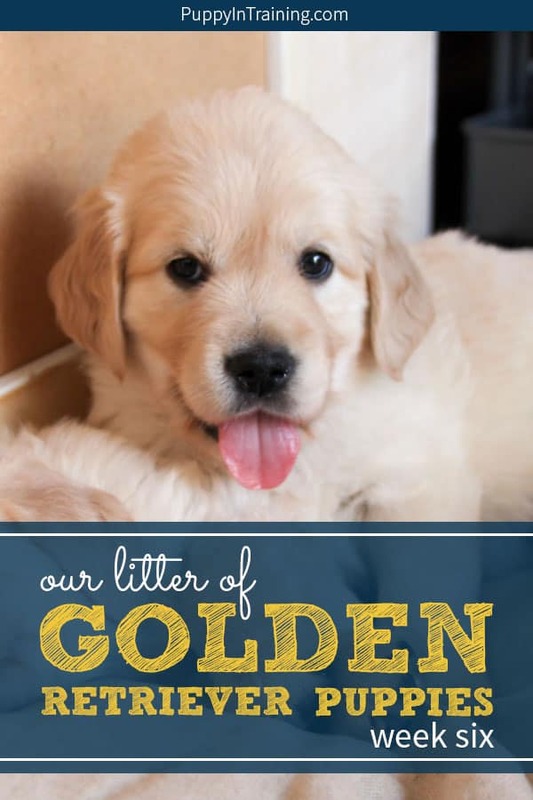 If you’re thinking about bringing home a Golden puppy then check out Puppies for Dummies. This is the first book we bought before bringing home our first puppy, Linus. It’s a great intro to raising and training a puppy. They look so much more alert than in week 5! Seems like their personalities are starting to come through. I’m not sure what you used to test if they are service dog training ready, but maybe one test should be if they try to escape the whelping box! 🙂 So cool to see them growing up! It seems like each week we saw exponential growth in their activity level and alertness. Escaping the whelping box would probably be a good trait for a search and rescue dog. Even though he was one of the smallest, Trooper was the first one to escape the whelping box. Today he’s in a prison program training to be a service dog. It has been fun to follow their progress each week. Looking forward to week 7 and 8! I’ve never had the opportunity to see or be around a litter of puppies, sounds like a dream come true! I would probably offer to clean the poop for you just so I could see those adorable pups every day! I accept your offer to clean up poop! The first 4 weeks are actually pretty easy since mama takes care of the mess, but after that it gets progressively worse each week. When I would come home it would look like a poop war broke out. Maybe I’ll take a picture of the disaster area next time with poop stuck to puppy fur and smeared on the whelping box walls. I guess without the smell a picture really wouldn’t do the scene justice. Is there a way to add smellivision to my blog? Yes! I love looking back at the pics of these little guys. We don’t sell our puppies we raise and train them to be service dogs. Many years ago we got our first puppy, Linus from the animal shelter. We found him by searching adoptable pets through petfinder.com. If you’re looking for a puppy, petfinder.com is a great place to start.